The use of such robots can not only save lives but can also help road construction companies cut down on labour costs. Next time you drive on a national highway, do not be surprised to see a robot flagman redirecting your vehicle off a construction patch. The road ministry is planning a large-scale deployment of such robots in the near future, even as a few construction firms have already started using them. A robotic flagman is an automated human skeleton made from plastic mounted on a stand and supported by a steel frame or wheels. The government, as well as road construction companies, feels these robots will help cut down on both labour costs and loss of lives. 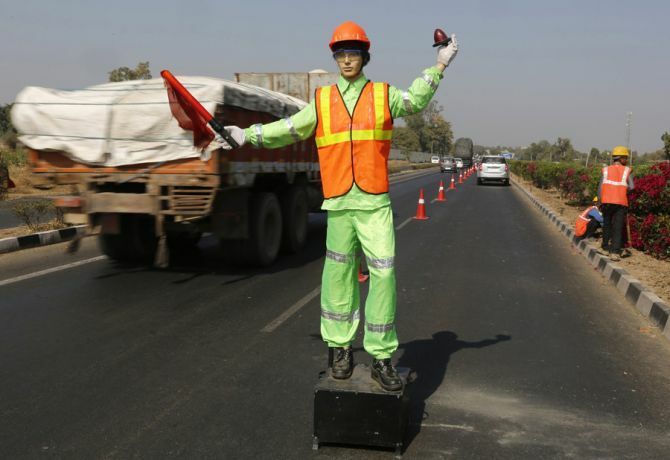 At least two companies - Ashoka Buildcon and IL&FS Transportation Networks (ITNL) - are using robots to regulate traffic at some of their construction sites. “Deploying a stationary robot in the direction of traffic can reduce the likeliness of an injury to a human being in case the vehicle enters a work zone,” said Mukund Sapre, executive director, ITNL, and managing director, IL&FS Engineering, in a note. ITNL has been using these robots on the Ahmedabad-Mehsana, Vadodara-Halol, Jetpur-Rajkot, and Sikar-Bikaner road projects. The road ministry in December informed Parliament it was toying with the idea of increasingly using robots at road construction and maintenance sites. “One of the concessionaires has used robots for traffic diversion signalling during the road construction and maintenance works, leading to no accidents at construction sites. "The feasibility of replication of this use of technology by other contractors is being explored,” the ministry said in response to a Lok Sabha question on technological innovations for road traffic problems, including frequent fatal accidents. According to the ‘Road Accidents in India’ report, national highways accounted for 29.6 per cent of the road accidents and 34.5 per cent of the people killed in 2016. The year saw 480,652 road accidents, which claimed 150,785 lives. In the past three to four years, labour costs have been the highest contributor to the increase in construction costs of highways. Labour costs involved in road construction have increased almost 50 per cent in the past three years. Though flagmen are a small portion of the entire labour at work, this could be seen as a start of using advanced technology techniques for road construction. The cost of a single robotic flagman is pegged at Rs 52,500, exclusive of the Goods and Services Tax (GST). “The use of robot flagmen is saving costs up to certain extent… Labourers, who are now hired just to work as a flagman, can be used for the physical execution of works,” Sapre said. Will robots take over HR?